What's the crew to do when Captain Dave falls and breaks his acetabulum? You make a rap video, of course! Check out the smooth stylings of David and crew! The boat refit is all about learning new things. Watch David as he learns how to make trampolines and brandishes a hammer with Thor like abandon! S.O.S! We've sprung a leak! Work is now well underway on SV Exit Only. Unfortunately, it looks like the boat has sprung a leak!! ... but from where? Captain Dave and David investigate to find the source of the leak. What will it take to fix the leak? How will this impact the rest of the refit? Will our 25 year old life raft float? SV Exit Only has been on the hard for over 10 years. It's time for a major refit. One of the first things we inspect is the life raft. Our Givens life raft is now 25 years old. It was purchased for our first trip in 1993. It's been re-certified twice and thankfully has never had to be deployed. Let's hope that three time's the charm. 25 years of heat and humidity has taken its toll on Exit Only. The cabin liner has to be replaced and its a major headache. Zoe and Joss walk us through the basics of installing new cabin liner aboard Exit Only. Exit Only sailed up the Red Sea in 2005. After passing through the Bab El Mandeb, we braved 40 knots of wind and sand storms. We discovered a unique and beautiful cruising ground in the Red Sea. We visited Oman, Yemen, Eritrea, Sudan and Egypt along the way. 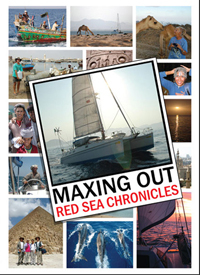 Come follow our adventures in these excerpts from our 2007 DVD The Red Sea Chronicles. Finishing off our 11 day Indian Ocean crossing, we are greeted by a flying fish attack. The Sea of Aden is well known for it's human trafficking and pirate attacks. While in Salalah, Oman we prepped for our next passage and make a plan to outwit the pirates. We make an unexpected stop in Aden and discover friendly people, a bustling market and delicious food. We hear scary news on the cruiser's net of a pirate attack on our fellow cruisers. We finally leave the dangerous waters of the Sea of Aden and pass through the Bab El Mandeb. What awaits us on the other side? Check out our DVD Red Sea Chronicles! Follow the journey of SV Exit Only up the Red Sea. A great gift for the sailor in your life for only $19.99! 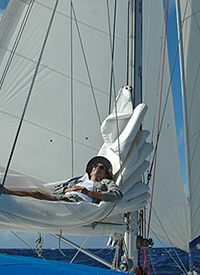 No Bruising Cruising -- Read Captain Dave's thoughts on the advantages of double head sail downwind cruising.